Proteon Therapeutics Announces Top-Line Data from Phase 3 PATENCY-1 Clinical Trial of Investigational Vonapanitase in Patients with CKD | Proteon Therapeutics Inc.
WALTHAM, Mass., Dec. 13, 2016 (GLOBE NEWSWIRE) -- Proteon Therapeutics, Inc. (Nasdaq:PRTO), a company developing novel, first-in-class therapeutics to address the medical needs of patients with kidney and vascular diseases, today announced that its first Phase 3 clinical trial with investigational vonapanitase, PATENCY-1, did not meet its primary endpoint of improved primary unassisted patency compared to placebo (p=0.254). However, the top-line results for the trial's secondary endpoint suggested that vonapanitase may improve secondary patency compared to placebo (p=0.048). Data from one of the trial's three tertiary endpoints also suggested vonapanitase may improve unassisted fistula use for hemodialysis (p=0.035) and any use of the fistula (unassisted or assisted) for hemodialysis (p=0.006). Adverse events reported for vonapanitase were similar to placebo. PATENCY-1 evaluated the safety and efficacy of a single dose of vonapanitase in patients with chronic kidney disease (CKD) receiving or expecting to receive hemodialysis who underwent surgical creation of a radiocephalic arteriovenous fistula. The multicenter, randomized, double-blind, placebo-controlled clinical trial enrolled 313 patients at 31 medical centers in the United States. Patients in the trial were followed for up to one year. The trial's primary endpoint, primary unassisted patency, is the length of time from fistula surgical creation to the first occurrence of a fistula thrombosis or corrective procedure to restore or maintain patency (blood flow). In PATENCY-1, vonapanitase-treated patients had a 17% reduction in the risk of primary unassisted patency loss over one year, compared to placebo (p=0.254). 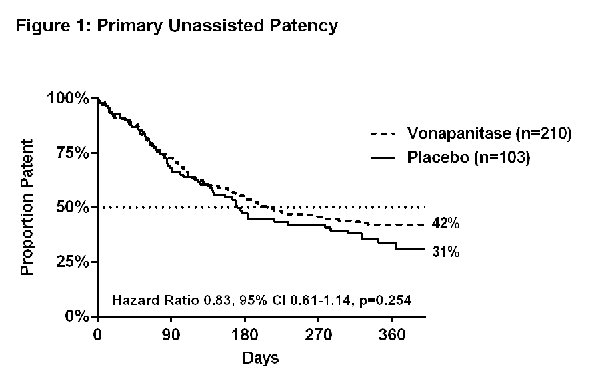 At the end of one year, 42% of patients who received vonapanitase retained primary unassisted patency, compared to 31% of placebo-treated patients. PATENCY-1's secondary endpoint, secondary patency, is the length of time from surgical creation until fistula abandonment (final failure). In PATENCY-1, vonapanitase-treated patients had a 34% reduction in the risk of secondary patency loss over one year, compared to placebo (p=0.048). 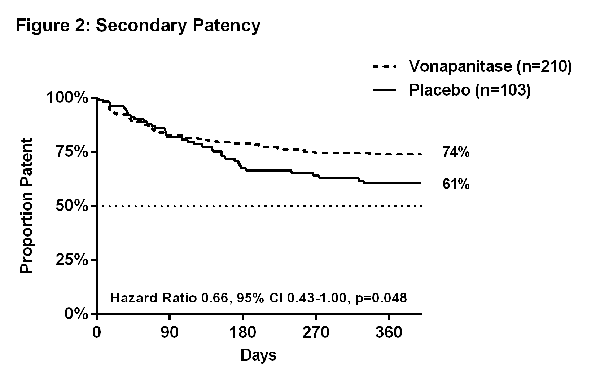 At the end of one year, 74% of vonapanitase-treated patients maintained secondary patency, compared to 61% of placebo-treated patients. Use for Hemodialysis. 39.2% of vonapanitase-treated patients achieved unassisted use of their fistula for dialysis, compared to 25.0% of placebo-treated patients (p=0.035). 63.9% of vonapanitase-treated patients used their fistula for dialysis (unassisted or assisted), compared to 44.4% of placebo-treated patients (p=0.006). Use for hemodialysis was defined as continuous use of the fistula for hemodialysis for at least 90 days or, if hemodialysis was not initiated at least 90 days prior to the patient's last visit, for at least 30 days prior to the patient's last visit and in use at the patient's last visit. Unassisted use was defined as use without prior loss of primary unassisted patency. Unassisted Maturation. 62.9% of vonapanitase-treated patients reached unassisted maturation, compared to 53.4% of placebo-treated patients (p=0.109). Unassisted maturation by ultrasound criteria, a tertiary endpoint, was defined as achieving a vein diameter ≥4 millimeters and blood flow ≥500 milliliters per minute by three months without loss of primary patency. Rate of Procedures to Restore or Maintain Patency. Over one year, vonapanitase-treated patients had 1.10 procedures per patient per year versus placebo-treated patients who had 1.48 procedures per patient per year (p=0.479). Procedures included thrombectomy, angioplasty, stent deployment and surgical revision. The proportions of patients reporting adverse events (AEs) were comparable between the vonapanitase and placebo arms of the study. The most common AEs were consistent with medical events experienced by CKD patients undergoing radiocephalic fistula surgery and are summarized in the table below. "We are disappointed that the study missed the primary endpoint. However, it appears that vonapanitase had a drug effect and we are encouraged by the secondary patency and fistula use for hemodialysis findings in this trial, both of which we believe are clinically important," said Steven Burke, M.D., Senior Vice President and Chief Medical Officer of Proteon Therapeutics. "We plan to review the full data set from PATENCY-1 and further investigate these findings in our ongoing Phase 3 clinical trial, PATENCY-2." "We want to thank the clinical investigators and the patients and their families who volunteered to participate in PATENCY-1. We have always recognized that this is an important and complex area of clinical development and Proteon remains committed to the dialysis patient community," stated Timothy Noyes, President and Chief Executive Officer of Proteon Therapeutics. "Because of the clinical importance of fistula abandonment and fistula use for hemodialysis to both patients and physicians, we plan to increase the planned enrollment of PATENCY-2 and look for other ways to use these results to guide our development efforts." As of November 30, 2016, Proteon had cash, cash equivalents and available-for-sale investments of $43.3 million. The Company expects these financial resources will be sufficient to fund its operations into the third quarter of 2018 based upon changes to our operating plan that we intend to implement. Proteon is hosting a webcast and conference call today, December 13, at 8:30 a.m. ET to discuss the top-line data from PATENCY-1. To access the conference call, please dial 844-263-8297 (U.S.) or 478-219-0006 (international) with Conference ID # 35676163. A live, listen-only webcast will also be accessible on the Investors & Media page of www.proteontx.com, including accompanying slides. A replay of the conference call will be available for two weeks on the Proteon website or by dialing 855-859-2056 (U.S.) or 404-537-3406 (international) and using Conference ID # 35676163. PATENCY-1 and PATENCY-2 are Phase 3, multicenter, randomized, double-blind, placebo-controlled clinical trials in patients with chronic kidney disease (CKD) receiving or expecting to receive hemodialysis and undergoing surgical creation of a radiocephalic arteriovenous fistula for hemodialysis. The studies were designed to evaluate, over one year, whether a single administration of 30 micrograms of vonapanitase can improve radiocephalic fistula patency, the period of time during which a fistula remains open with adequate blood flow to enable hemodialysis. Proteon today announced results of PATENCY-1, which enrolled 313 patients at 31 centers in the United States. Proteon continues to enroll patients in PATENCY-2, the second Phase 3 clinical trial. Proteon expects to reach enrollment of 300 patients in this trial at approximately 40 centers in the United States and Canada in the first quarter of 2017. Proteon expects to report top-line results from PATENCY-2 in the second quarter of 2018. In the most severe stage of chronic kidney disease (CKD), also known as kidney failure, the kidneys can no longer function to sustain life. The majority of patients with kidney failure undergo chronic hemodialysis, which requires a high-flow vascular access to repeatedly connect the patient's bloodstream to a hemodialysis machine for this life-saving treatment. The preferred form of vascular access for hemodialysis is a radiocephalic arteriovenous fistula, created when a surgeon connects a vein to an artery in the lower arm, resulting in a substantial increase in blood flow and vein dilation. No FDA approved preventative treatments currently exist to improve fistula patency. Vonapanitase (formerly PRT-201) is an investigational drug intended to improve arteriovenous fistula patency, the period of time during which a fistula remains open with adequate blood flow to enable hemodialysis. Vonapanitase is applied in a single administration and is currently being studied in a Phase 3 program in patients with chronic kidney disease (CKD) undergoing surgical creation of a radiocephalic arteriovenous fistula for hemodialysis. Vonapanitase has received fast track and orphan drug designations from the U.S. Food and Drug Administration (FDA), and orphan medicinal product designation from the European Commission, for hemodialysis vascular access indications. In addition, vonapanitase may have other surgical and endovascular applications in diseases or conditions in which vessel injury leads to blockages in blood vessels and reduced blood flow. Proteon is currently conducting two Phase 1 clinical trials of vonapanitase in patients with peripheral artery disease (PAD). Proteon Therapeutics is committed to improving the health of patients with kidney and vascular diseases through the development of novel, first-in-class therapeutics. Proteon's lead product candidate, vonapanitase, is an investigational drug intended to improve arteriovenous fistula patency, the period of time during which a fistula remains open with adequate blood flow to enable hemodialysis. Proteon is currently evaluating vonapanitase in patients with chronic kidney disease (CKD) undergoing surgical creation of a radiocephalic arteriovenous fistula. Proteon today released results from its first Phase 3 trial, PATENCY-1, and is currently enrolling patients in an additional Phase 3 clinical trial, PATENCY-2. Proteon is also evaluating vonapanitase in two Phase 1 clinical trials in patients with peripheral artery disease (PAD). For more information, please visit www.proteontx.com. This press release contains statements that are, or may be deemed to be, "forward-looking statements." In some cases these forward-looking statements can be identified by the use of forward-looking terminology, including the terms "estimates," "anticipates," "expects," "plans," "intends," "may," or "will," in each case, their negatives or other variations thereon or comparable terminology, although not all forward-looking statements contain these words. These statements, including the number of patients to be enrolled in and the timing of enrollment in the PATENCY-2 Phase 3 clinical study of vonapanitase, when the Company expects to report top-line data from the PATENCY-2 Phase 3 clinical study of vonapanitase, the potential treatment of renal and vascular diseases with vonapanitase, the effect or benefit of vonapanitase in patients with CKD, whether vonapanitase improves AVF patency or use, the potential surgical and endovascular applications for vonapanitase, including PAD, the sufficiency of the Company's cash, cash-equivalents and available-for-sale investments to fund the Company's operations into the third quarter of 2018, and those relating to future events or our future financial performance or condition, involve substantial known and unknown risks, uncertainties and other important factors that may cause our actual results, levels of activity, performance or achievements to differ materially from those expressed or implied by these forward-looking statements. These risks, uncertainties and other factors, including whether our cash resources will be sufficient to fund our operating expenses and capital expenditure requirements for the period anticipated; whether data from early nonclinical or clinical studies will be indicative of the data that will be obtained from future clinical trials; whether vonapanitase will advance through the clinical trial process on the anticipated timeline and warrant submission for regulatory approval; whether such a submission would receive approval from the U.S. Food and Drug Administration or equivalent foreign regulatory agencies on a timely basis or at all; and whether we can successfully commercialize and market our product candidates, are described more fully in our Annual Report on Form 10-K for the year ended December 31, 2015, as filed with the Securities and Exchange Commission ("SEC") on March 14, 2016, and our subsequent Quarterly Reports on Form 10-Q and Current Reports on Form 8-K, as filed with the SEC, particularly in the sections titled "Risk Factors" and "Management's Discussion and Analysis of Financial Condition and Results of Operations." In light of the significant uncertainties in our forward-looking statements, you should not place undue reliance on these statements or regard these statements as a representation or warranty by us or any other person that we will achieve our objectives and plans in any specified time frame, or at all. The forward-looking statements contained in this press release represent our estimates and assumptions only as of the date of this press release and, except as required by law, we undertake no obligation to update or revise publicly any forward-looking statements, whether as a result of new information, future events or otherwise after the date of this press release.